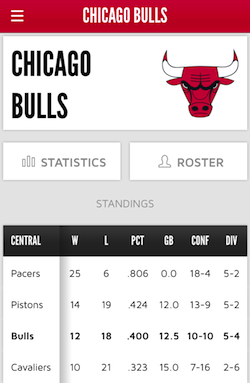 The Chicago Bulls launched the team’s first mobile app Thursday. The app offers live scores, stats, standings and schedules, as well as team news. Basketball fans won’t find live video of games, but they can tune in for a play-by-play rundown. Post-game recap video will be available. Push notifications will alert fans to game starts, score updates and breaking news. Some of the app features will particularly appeal to those already in the stadium, such as an “amenity” listing that details where all the concessions are located. Ticket purchases are also possible via an in-app Ticketmaster search. The free app is sponsored by AT&T. It’s available on iOS or Android.